Fantastical - a surreal showcase. A spontaneous showcase of jewellery for autumn that brings together fantasy, colour and playfulness! Fantastical brings together the work of two very well known jewellers: Frances Wadsworth-Jones and Xavier Monclus and also includes exciting work by two new graduates. 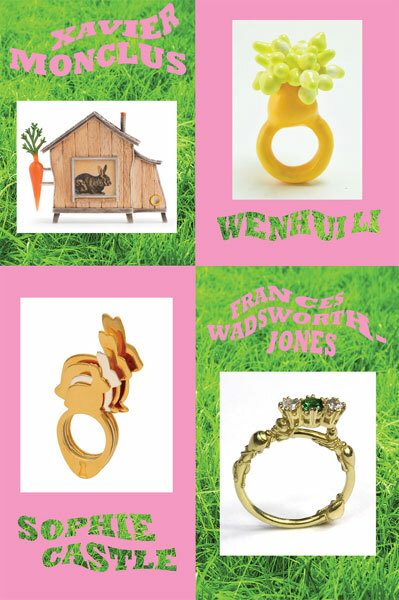 Wadsworth-Jones’ comical yet subversive miniature creatures can be worn on the finger or the lapel while internationally renowned Barcelona based jewellery artist Xavier Monclus’ fanciful surrealist inventions appropriate pictures and objects from a childhood world (are they jewellery to play with or toys to wear?). Central St Martins graduate Wenhui Li creates fresh and fantastical ring structures that combine diverse and sometimes surprising materials in a painterly way, creating spectacular and extraordinary organic forms. 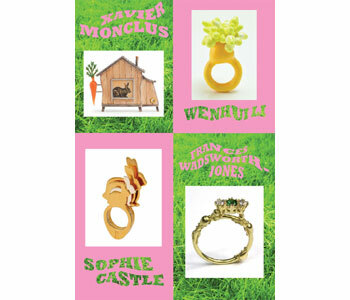 Brand new jewellery label Sophie Castle’s Year of the Rabbit collection is pure whimsical English eccentric: laser cut rabbit or mustachioed spectacle designs in rose or yellow gold plate. Artists taking part in Fantastical are: Frances Wadsworth-Jones; Xavier Monclus; Wenhui Li; Sophie Castle.